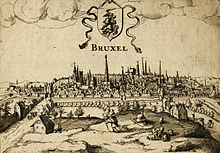 The Ceety o Brussels (French: Bruxelles-Ville or Ville de Bruxelles, Dutch: Stad Brussel) is the lairgest municipality o the Brussels-Caipital Region, an the offeecial caipital o Belgium bi law. Somewha in the wey that the Ceety o Lunnon is different frae Lunnon, the Ceety o Brussels is different frae Brussels. Housomeivver, the expansion o the ceety wis frozen at a later stage than the Ceety o Lunnon, so that in addition tae the auld centre o Brussels, the touns o Haren, Laeken an Neder-Over-Heembeek tae the north, an Avenue Louise an the Bois de la Cambre pairk tae the sooth, are includit. On 1 Januar 2006, the Ceety o Brussels haed a total population o 144,784. The total aurie is 32.61 km² which gives a population density o 4,440 inhabitants per km². As o 2007, there wur approximately 50,000 registered non-Belgians in the Ceety o Brussels. At first, the Ceety o Brussels wis simply defined, being the aurie athin the seicont waws o Brussels, the modren-day sma ring. As the ceety grew, the surroondin veelages grew as well, eventually growin intae a contiguous ceety, though the local govrenments retained control o their aurie. The construction o Avenue Louise was commissioned in 1847 as a monumental avenue bordered by chestnut trees that would allow easy access to the popular recreational aurie o the Bois de la Cambre. Housomeivver, fierce resistance tae the project wis put up bi the toun o Ixelles (which wis then still separate frae Brussels) through whose land the avenue wis supposed tae run. Efter years o fruitless negotiations, Brussels feenally annexed the narrae baund o land needit for the avenue plus the Bois de la Cambre itsel in 1864. That decision accoonts for the unuisual sootheastren protrusion o the Ceety o Brussels an for Ixelles being split in twa separate pairts. The Université Libre de Bruxelles' Solbosch campus is an a pairt o the Ceety o Brussels, pairtially accoontin for the bulge in the sootheast end. Unlike maist o the municipalities in Belgium, the anes locatit in the Brussels-Caipital Region wur no merged wi ithers durin mergers occurrin in 1964, 1970, an 1975. 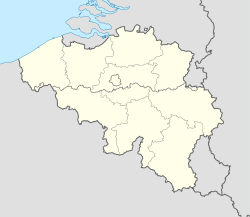 Housomeivver, several municipalities been merged wi the Ceety o Brussels throughoot its history includin Laeken, Haren, an Neder-Over-Heembeek, which wur merged intae the Ceety o Brussels in 1921. As in ivery ither Belgian municipality, the Ceety o Brussels is heidit bi a mayor, which shoud be ramseefelt wi neither the Meenister-Preses o the Brussels-Caipital Region nor the Govrenor o Brussels-Caipital. Accordin tae the Belgian Constitution (Art. 194) the caipital o Belgium is the Ceety o Brussels municipality. Arguments that the uise o lawer case in "ville" and "stad" in Airticle 194 for "ville de Bruxelles" (French), "stad Brussel" (Dutch) makes a subtle difference an means that Brussels at lairge is the caipital canna be defendit on a legal basis. Housomeivver, although the Ceety o Brussels is the offeecial caipital, the funds delegatit bi the federation an region for the representative role o the caipital are dividit amang the 19 municipalities an, in practice, naitional Belgian institutions are indeed locatit no anerlie in the Ceety o Brussels, although mony are, but an aa in maist o the ither 18 municipalities o the Brussels-Caipital region. The implication is that de facto the entire Region serves as caipital, but de jure anerlie the Ceety o Brussels is entitled tae the title o caipital o Belgium. ↑ Picavet, Georges (29 April 2003). "Municipalities (1795-now)". Georges Picavet. Retrieved 2009-04-05. ↑ "Brussels Capital-Region". Georges Picavet. 4 June 2005. Retrieved 2009-04-05. Wikimedia Commons haes media relatit tae Brussels. This page wis last eeditit on 4 Mairch 2018, at 02:35.